To me it seems that Visual Studio Team System 2008 Database Edition is the stepchild of the Visual Studio family. Even in shops that have MSDN Universal/Ultimate subscriptions this version is just not used that much. Maybe it is that long name of this product, I still prefer DataDude. I would like to show you that if you do have licenses for this tool then you should use it because it has some great features. Today we will focus on static code analysis. Once your database is setup go to the Solution explorer, right click on the project and select Import Database Objects and Settings. 1/30/2010 11:26:40 AM Import of database schema has started. 1/30/2010 11:26:46 AM Finished adding all files to the project. 1/30/2010 11:26:46 AM Import of database schema is complete. 1/30/2010 11:26:46 AM A summary of the import operation has been saved to the log file C:SVNInterrogateASPInterrogateASPImport Schema LogsInterrogateASP_20100130042639.log. ASPNET_APPLICATIONS_CREATEAPPLICATION.PROC.SQL(7,79)Warning : SR0015 : Microsoft.Performance : Deterministic function call (LOWER) might cause an unnecessary table scan. ASPNET_APPLICATIONS_CREATEAPPLICATION.PROC.SQL(24,15)Warning : SR0015 : Microsoft.Performance : Deterministic function call (LOWER) might cause an unnecessary table scan. ASPNET_CHECKSCHEMAVERSION.PROC.SQL(9,35)Warning : SR0015 : Microsoft.Performance : Deterministic function call (LOWER) might cause an unnecessary table scan. ASPNET_MEMBERSHIP_CHANGEPASSWORDQUESTIONANDANSWER.PROC.SQL(11,38)Warning : SR0010 : Microsoft.Design : Old-style JOIN syntax is used. ASPNET_MEMBERSHIP_CHANGEPASSWORDQUESTIONANDANSWER.PROC.SQL(11,58)Warning : SR0010 : Microsoft.Design : Old-style JOIN syntax is used. ASPNET_MEMBERSHIP_CHANGEPASSWORDQUESTIONANDANSWER.PROC.SQL(12,31)Warning : SR0015 : Microsoft.Performance : Deterministic function call (LOWER) might cause an unnecessary table scan. ASPNET_MEMBERSHIP_CHANGEPASSWORDQUESTIONANDANSWER.PROC.SQL(14,13)Warning : SR0015 : Microsoft.Performance : Deterministic function call (LOWER) might cause an unnecessary table scan. ASPNET_USERSINROLES_GETUSERSINROLES.PROC.SQL(9,75)Warning : SR0015 : Microsoft.Performance : Deterministic function call (LOWER) might cause an unnecessary table scan. ASPNET_USERSINROLES_GETUSERSINROLES.PROC.SQL(17,14)Warning : SR0015 : Microsoft.Performance : Deterministic function call (LOWER) might cause an unnecessary table scan. ASPNET_USERSINROLES_GETUSERSINROLES.PROC.SQL(23,32)Warning : SR0010 : Microsoft.Design : Old-style JOIN syntax is used. ASPNET_USERSINROLES_ISUSERINROLE.PROC.SQL(10,75)Warning : SR0015 : Microsoft.Performance : Deterministic function call (LOWER) might cause an unnecessary table scan. ASPNET_USERSINROLES_ISUSERINROLE.PROC.SQL(20,31)Warning : SR0015 : Microsoft.Performance : Deterministic function call (LOWER) might cause an unnecessary table scan. ASPNET_USERSINROLES_ISUSERINROLE.PROC.SQL(27,31)Warning : SR0015 : Microsoft.Performance : Deterministic function call (LOWER) might cause an unnecessary table scan. ASPNET_USERSINROLES_REMOVEUSERSFROMROLES.PROC.SQL(10,64)Warning : SR0015 : Microsoft.Performance : Deterministic function call (LOWER) might cause an unnecessary table scan. ASPNET_USERSINROLES_REMOVEUSERSFROMROLES.PROC.SQL(52,32)Warning : SR0010 : Microsoft.Design : Old-style JOIN syntax is used. ASPNET_USERSINROLES_REMOVEUSERSFROMROLES.PROC.SQL(60,83)Warning : SR0010 : Microsoft.Design : Old-style JOIN syntax is used. ASPNET_USERSINROLES_REMOVEUSERSFROMROLES.PROC.SQL(86,32)Warning : SR0010 : Microsoft.Design : Old-style JOIN syntax is used. ASPNET_USERSINROLES_REMOVEUSERSFROMROLES.PROC.SQL(94,83)Warning : SR0010 : Microsoft.Design : Old-style JOIN syntax is used. ASPNET_USERSINROLES_REMOVEUSERSFROMROLES.PROC.SQL(102,35)Warning : SR0010 : Microsoft.Design : Old-style JOIN syntax is used. ASPNET_USERSINROLES_REMOVEUSERSFROMROLES.PROC.SQL(102,47)Warning : SR0010 : Microsoft.Design : Old-style JOIN syntax is used. ASPNET_USERSINROLES_REMOVEUSERSFROMROLES.PROC.SQL(108,23)Warning : SR0010 : Microsoft.Design : Old-style JOIN syntax is used. ASPNET_USERSINROLES_REMOVEUSERSFROMROLES.PROC.SQL(108,36)Warning : SR0010 : Microsoft.Design : Old-style JOIN syntax is used. ASPNET_USERSINROLES_REMOVEUSERSFROMROLES.PROC.SQL(108,56)Warning : SR0010 : Microsoft.Design : Old-style JOIN syntax is used. ASPNET_USERSINROLES_REMOVEUSERSFROMROLES.PROC.SQL(110,7)Warning : SR0004 : Microsoft.Performance : A column without an index that is used as an IN predicate test expression might degrade performance. ASPNET_USERSINROLES_REMOVEUSERSFROMROLES.PROC.SQL(111,7)Warning : SR0004 : Microsoft.Performance : A column without an index that is used as an IN predicate test expression might degrade performance. ASPNET_USERSINROLES_REMOVEUSERSFROMROLES.PROC.SQL(118,8)Warning : SR0004 : Microsoft.Performance : A column without an index that is used as an IN predicate test expression might degrade performance. ASPNET_WEBEVENT_LOGEVENT.PROC.SQL(44,9)Warning : SR0014 : Microsoft.Design : Data loss might occur when casting from Decimal to Decimal. ASPNET_WEBEVENT_LOGEVENT.PROC.SQL(45,9)Warning : SR0014 : Microsoft.Design : Data loss might occur when casting from Decimal to Decimal. Now I was intrigued so I picked the aspnet_Applications_CreateApplication stored procedure from that list. 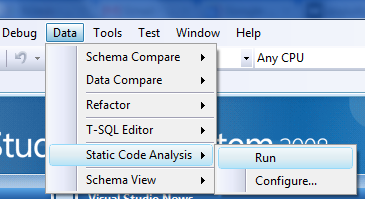 So, as you can see it is pretty simple to use Visual Studio Team System 2008 Database Edition to perform static code analysis, the question is of course if you dare to run this against your own database?